rec. 5-8 March 2016, Andreaskirche, Berlin. DDD. rec. January 2017, Richard B Fisher Center, Bard College, USA. DDD. Ferdinand Ries is, perhaps, best known as one of Beethoven’s pupils and co-author of an important early biography of him, but he has gathered a significant discography in recent years, to which the chief contributors have been Naxos and CPO. 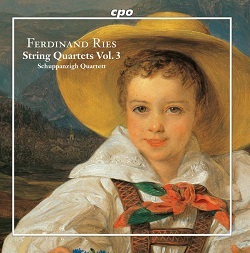 This is the third volume which the latter have devoted to his string quartets, performed by the Schuppanzigh Quartet, a somewhat tardy follow-up to volume 2, released in 2008 and recorded in 2005! (CPO 777227-2 – review). Kevin Sutton liked that release, if not very enthusiastically, but decried the obtuse programme notes. Patrick Waller was rather warmer in his praise of volume 1 – review. The music is clearly indebted to Beethoven, but so are the string quartets of even the better-known composers of Ries’s generation. I’m not suggesting that there is anything here to compare with the music of Brahms or Mendelssohn, but even they never managed to break wholly free from the master’s shadow in their chamber compositions. In any case, it would be unfair to expect these comparatively early works – despite the high opus numbers – to match the best of Beethoven, whose own late quartets were ten years away (1825/86). His Op.95, rightly regarded as on the cusp of the late style, dates from 1810. The performances are very accomplished. There seem to be no competitors in the catalogue, and I doubt that any possible future releases could better those on this album. I enjoyed hearing it enough to check out its predecessors via Naxos Music Library – subscribers will find all three volumes there, together with CPO recordings of his piano quartets (999885-2 – review – review) and flute quartets (555051-2 – review). They also offer his Piano Quintet, Op.74, and Sextets, Op.100 and 142 (999622-2). The sound quality is bright but not lacking in warmth. Those in search of high-res, however, will have to look in vain – 16-bit, or the CD from which I reviewed the album, seems to be the best on offer. The notes to volume 3 are less abstruse than KS found those of its predecessor, though there are times when they are a little flowery – unsuitable for military service in 1805, ‘this chalice passed him by (mangels Tauglichkeit ging der Kelch zwar an ihm vorüber)’. The English version could also have done with more thorough proof-reading – ‘he was forced make ends meet’. The Piano Concertos are more mature works, composed after his return from an eleven-year stay in England, hence the subtitle of No.8, his greeting to the Rhine which flows past his home town of Bonn. It’s an attractive work and Piers Lane makes it sound almost first-rate. I haven’t heard the Naxos recording, with Christopher Hinterhuber, the New Zealand Symphony Orchestra and Uwe Grodd, but it was well received here by Colin Clarke and Glyn Pursglove in 2006 and I enjoyed two later volumes in the series – DL Roundup December 2010, also volume 5 in DL News 2012/24. See also review of volume 3 by Dan Morgan. An economic fact-check may be in order: the Naxos recordings come at budget price; though that means about £7.50 nowadays, it’s still likely to be around £5 less than the Hyperion. Even downloaders will find a price differential, with the Hyperion at £8.99 (£13.50 for 24-bit) and my guide-price for the Naxos download £4.791 (16-bit lossless, with pdf booklet; no 24-bit available). None of which is meant to downplay the value of the new Hyperion which, if anything, is marginally preferable to the Naxos as a performance and definitely preferable for those requiring 24-bit sound – well worth going for in this case, despite the price differential. The other works are not comparable in quality with Concerto No.8, but are well worth hearing in these persuasive performances. 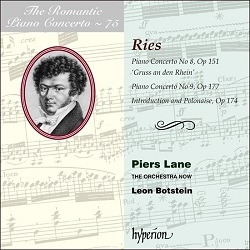 Piers Lane, the doyen of this Hyperion series, is joined by an orchestra which I hadn’t encountered before, but who give a good account of themselves at the hands of a conductor whose work I have often enjoyed, though not, I believe on Hyperion. Terry Barfoot in his review – link below – noted that the recording balance favours the piano, but, true as that is, it didn’t trouble me in listening to this music. You will need to decide if it’s worth paying more for the new Hyperion than for the Naxos. My answer would be yes, but I didn’t have to pay for the 24/96 download. As to the comparative merits of these two recordings of Ries reviewed here, neglected music that is beginning to be better appreciated, I suppose that I would plump for the Hyperion first, but the CPO also gave me a good deal of pleasure. 1 Don’t pay more for mp3, as much as £7.89 without booklet.